The Sounders can secure a first-round bye and avoid a knockout-round game if they beat San Jose at home Sunday and FC Dallas fails to win at Colorado. But it may not matter much, as teams winning knockout games have gone on to defeat bye teams in 10 of 20 next-round playoff series. Avoiding a dreaded Knockout Round match will be a hot topic Sunday as the Sounders finish off their torrid late-season run. The question is whether skipping the sudden-death midweek playoff match is truly worth the amount of discussion it generates. For all the angst of players and coaches wanting a first-round playoff bye, there is evidence it might not matter much in the bigger picture. Sure, it’s easier to skip a one-off round rather than risk playing in it and losing. But Major League Soccer teams playing knockout games at home — as the Sounders likely would — usually wind up winning and then historically have had just as good a shot at advancing beyond the next round as their first-round bye opponents do. Critics have long contended MLS devalues its interminably long regular season by not making it tougher on lower-seeded playoff teams. And the fact knockout winners have gone on to win the next round at a 50 percent rate tends to support this, though you won’t find many players complaining about getting some added rest. Alonso’s point about avoiding a single-elimination playoff match Wednesday or Thursday, before a Western Conference semifinal the following Sunday, is a common argument in favor of a bye. The Sounders can bypass that three-games-in-one-week logjam and get a week off before a second-round playoff match if they beat the MLS-worst Earthquakes and FC Dallas either loses or ties at Colorado. Still, it’s debatable how much of a true edge that would give them in pursuit of a championship. And whether any fatigue factor impacting knockout-round survivors is trumped by the momentum they gain from winning a midweek playoff opener days before their second-round matches. Since MLS began the knockout stage in 2011, the lower-seeded team has actually won the next round 10 of 20 times against higher-seeded squads coming off first-round byes. Clubs that played in the knockout round have also won three of the seven MLS Cup finals since 2011, two of those coming the past three years under the current 12-team playoff format. Those statistics fuel criticism that MLS drags out a 34-game regular season for eight months, only to have a playoff free-for-all prone to upsets. The playoff schedule itself is an inconsistent medley of games crammed over short periods, then stretched out over longer ones to accommodate the international break. It’s tough to tell what the regular season will mean this year, especially in a Western Conference in which none of six playoff seeds is decided despite a schedule that began in early March. A single slate of afternoon games Sunday could finish with the Sounders as high as No. 2 and the first-round bye, or as low as No. 5 and playing a knockout-round match at Portland. Sporting Kansas City could win the conference title, or finish fourth and also play a knockout match. He added that owners have long wrestled with an “unbelievably long season’’ and inconsistent playoff schedule and tried to make it as meaningful as possible. There have also been discussions around tweaking the number of playoff teams, adjusting series length and whether to keep or abandon the “away goals’’ tiebreaker. But nothing, he said, is imminent. Some suggest the two-legged conference-semifinal format favors the knockout-round survivor because, as the lower seed, it gets to play the opening leg at home fresh off a playoff victory. The Sounders saw both sides of that during their past two playoff runs. They got a first-round bye a year ago and then went into Vancouver and played a snoozer of a scoreless draw in the conference-semifinal opener in which they couldn’t generate any attack. Two years ago, the Sounders beat SKC in their knockout-round match, then stunned Supporters’ Shield winner Dallas 3-0 in the conference-semifinal opener at CenturyLink Field three days later. Dallas looked rusty after its first-round bye and never recovered, going on to lose the series on aggregate. The Sounders last year did recover — barely — after the opening-leg draw, but needed a pair of second-half goals at home to finally defeat the Whitecaps. 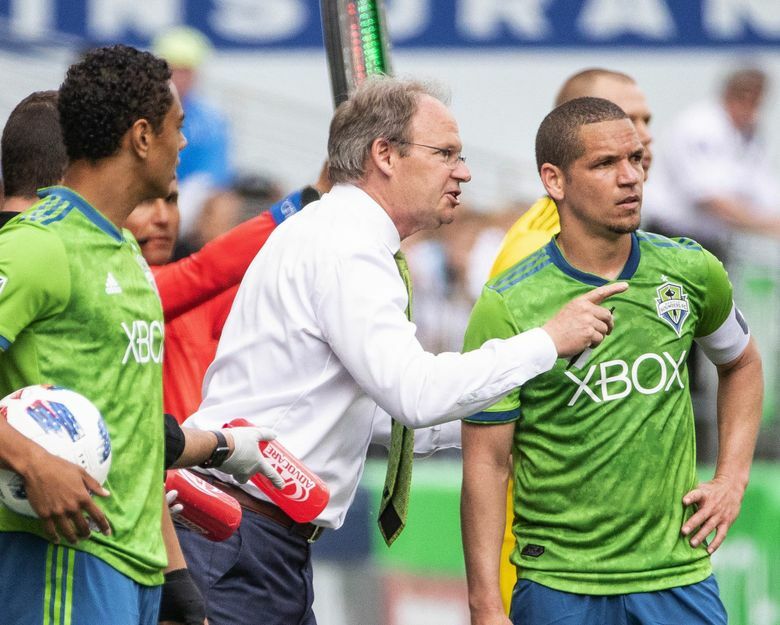 Nonetheless, Sounders coach Brian Schmetzer said he would still take the bye if offered. Schmetzer’s team on Sunday will try for its 14th victory in 16 games. But a loss could see the Sounders tumble to fifth place and forced to play at Portland midweek. And the road is no place Schmetzer wants to be playing a one-off game — away teams have won only five of 20 knockout games since 2011 — especially against a bitter rival. For him, it’s the best reason to avoid the knockout round, even if teams have used it as a springboard to success: There’s no guarantee you’ll survive to play that second round. So, for now, Schmetzer and the Sounders will look to win out, finish as high as possible and worry about what lies ahead rather than in playoffs past.